"A smile is a curve that sets everything straight," according to comedian and actress Phyllis Diller. She must have been a Jeep driver, because she gets us. 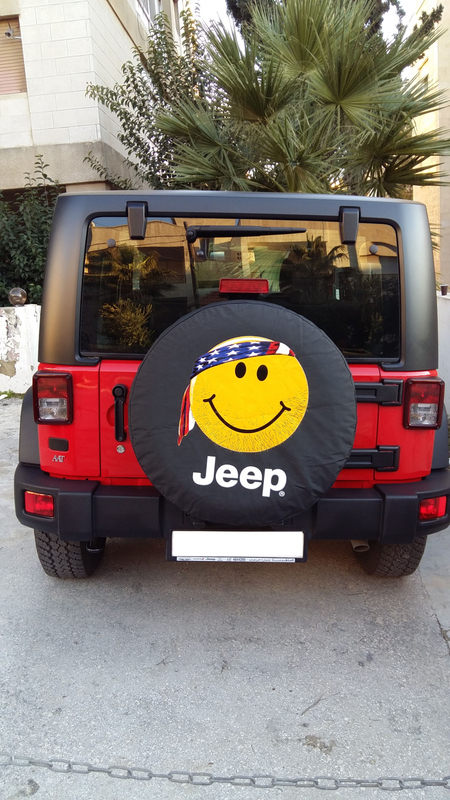 The smiley face has long been an icon associated with Jeeps, partly because of the smiles that end up on drivers' faces during an adventure. 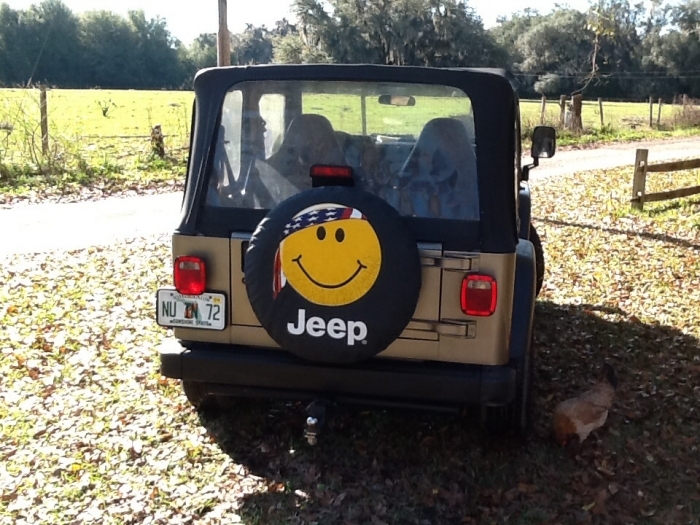 But the Jeep smiley face has taken on a life of its own. 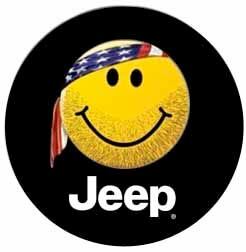 No throw-away emoji, the Jeep smiley face logo has evolved to capture the spirit of its drivers, sporting a fresh coat of stubble and an American flag bandana. It's an icon Jeep drivers love to show the world. Now it's your turn. Just for Jeeps offers the legendary illustration on a durable tire cover manufactured by OEM Mopar. Available in several different sizes, this slip-on 32-inch tire cover (a range of sizes are available) will protect your spare tire from the elements. It will also perfectly display the pride you have in your Jeep. 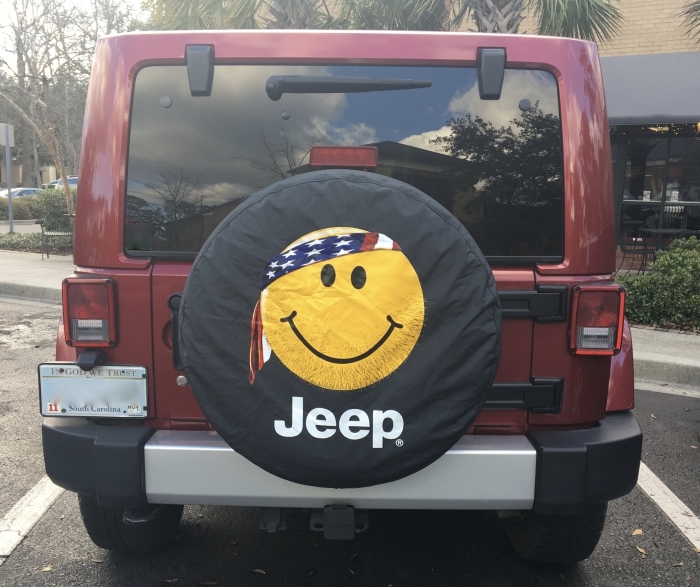 Pick up your Jeep smiley face tire cover today at a discount - Just for Jeeps offers deals that dealers won't touch - and put a smile on the face of everyone who drives behind you. Item # 82208686AD - Fits Tire Size P245/75R16 & 31"x10.5"
Item # 82212305AB - Fits Tire Size 33"x12.50"
The Smiley Face tire cover meets my expectations, fits well, and is simply a fun thing to have. as well, which makes it doubly enjoyable! Arrived on time.just as expected. Love my new tire cover, fits like a glove too! Thanks again! Fit great. Price was right. Product itself seems decent so far. Shipping was quite slow however. Shipped quickly and arrived perfect! No problems. Make sure you find the correct cover product number that associates with your tire size. Easy order system, delivered in just a few days, easy slip on. Perfect. Never seen one like this one. ProsEasy Order. Items is just as pictured. Great positive image. Great experience with transaction and quick delivery.The spare tire cover is very high quality and fits great. Exactly as described! He loved it! Very durable , colorful and fits very well, order was delivered before promised date, very happy with overall service!! Was a little concerned about the cover fitting the tire as the parts person where the Jeep was purchased said the item was "out of stock" and not available. Matched the tire size with the website info and hit the order button. The cover fits! Will see how it holds up to the sun and weather. Overall, a pleasant experience with the transaction. He looks great on my Jeep and "she" loves him too. This was a gift of my wife for her Jeep. ProsFits perfectly. Easy on - Easy off. Easier to get on and off the spare tire than the original tire cover. Product was of exceptional craftsmanship and fit as expected.